On occasion, I receive book review requests that I choose not to take...usually because I feel that the content of the book does not fit the content of my blog or discusses are particular area that I don't feel fully qualified to evaluate. 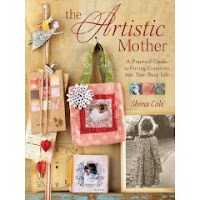 Mixed media art would be one of those areas and since the projects in The Artistic Mother: A Practical Guide to Fitting Creativity into Your Life by Shona Cole certainly fit into that category, I have to admit that I almost did pass this one up. "Why should mother take time to create art?" "The sense of well-being and fulfillment our creativity generates often spills over into other areas of life, including our mothering." "There are many reasons why we are moved to make art. To communicate a message or to reveal some part of ourselves, to amuse others, to commemorate events and milestones, to come to a deeper understanding of inner feelings. And then there is the simple act of just making beauty. Art for art's sake to give pleasure to the eye, to provide the spirit with a gentle place to rest and contemplate loveliness." Firstly, there is a discussion of why it is important for artistically inclined mothers to do art, followed by a short chapters on the nature of creativity, finding the time and motivation to do art and organizing your life so that you can fit art into it. Secondly, there are some chapters introducing you to the basics skills in collage, photography and poetry writing. Thirdly, there is a 12 week workshop that guides you through making family focused art. Each week has an action plan to help you prepare for later weeks and meet the goals of that week’s art making. Peppered through out the book are interviews with seven moms who are living the artistic mother lifestyle, be prepared to be inspired! The interviews included feature Shannon Mucha, Corey Moortgat, Rebecca Sower, Misty Mawn, Susan Tuttle, Ellen McClay, and Audrey Hernandez. Again, while the projects are mixed media, it is easy to see how the ideas and concepts could easily be applied to other various forms of art - even clean and simple scrapbooking! This chapter discusses the four stages of THE CREATIVE PROCESS including imagining and research, preparation, project execution and resolution. Cole also includes a section called LEARNING FROM THE WISE which creates an analogy to how we should approach our creative life. Don't we all need more of this from time to time?! This chapter includes three sections. The first - THE ARTISTIC VISION STATEMENT & GOALS LISTS - outlines why these concepts are so important and how to write them. Cole provides examples to help you in this crucial step. Next she addresses ACCOUNTABILITY. Just like a friend or support group can help you stay on track with a diet, so can other resources help you live your most creative life. Finally, Cole discusses the idea of RITUAL. As creatives, we must recognize how our five senses affect our creativity and use it to our advantage. In CREATING TIME, Cole recognizes a big complaint among mothers - there is simply not enough time. Cole names some time stealers, time savers and time finders to leave this excuse in the dust. Next, Cole offers tips for finding and organizing your creative area in CREATING SPACE. In THE ART ACTION PLAN, there are creative motivators to keep you moving forward. Photography: Cole covers camera features and settings, elements of composition, basic photo processing and tips on working with children. Poetry: This was one of the sections that really intrigued my upon my first flip through due to my own history with writing. While I used to be an avid poet for much of elementary school and then high school, it's certainly not something I have maintained in my adult life. Cole has inspired me to revisit this love to add a deeper meaning to my future layouts. Cole asserts that no matter your experience , adding your own poetic language can add volumes to your art and offers insightful instruction on getting started with putting pen to paper and coming to a final, and meaningful, product. Mixed Media & College: Cole defines this medium as 'the combination of more than one art medium'. She includes a beginner's guide of supplies - which is, not surprisingly, quite similar to a standard scrapbooker's supply - and offers ideas for growing your stash. The last half of the book is dedicated to a call to action with 12 projects designed to be completed over 12 weeks using the ideas, concepts and techniques discussed in the first half of the book. Of course, the length of the workshop and be shortened or lengthened to fit any one's creative timetable. The main idea is to have a timetable. It starts with a PREP WEEK section that covers activities and tolls you'll need to be ready for the creative process. Contributing artists in addition to the author include Shelley Kommers, Mendy Mitrani, Carrie Harney, Sarah Keith, and Cindy Mayfield. If you need a little infusion of inspiration and direction in your creative life, The Artistic Mother: A Practical Guide to Fitting Creativity into Your Life might be just the book for you! Have you read Cole's book? If so, what ideas and/or concepts were most helpful and inspiring to you. If not, which areas are you most intrigued by based on this review?